Who was Andre the Giant? The star of Wrestlemania. The star of the beloved The Princess Bride. A big hearted literal giant beloved by all. But who was he really? 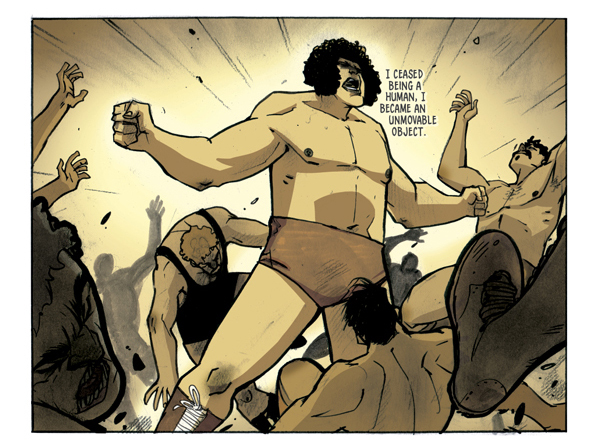 The legendary icon comes to life in a newly released graphic novel called Andre the Giant: Closer to Heaven. As a child of the 80's, as well as a fan of WWF (now WWE) wrestling, I grew up watching Andre the Giant decimate opponents in the ring on a regular basis. I was a fan of the theatrics and the story lines that were crafted for each of the wrestlers, but Andre the Giant was a bit of a mystery. We never got too much of his back story. Some of that mystery is about to change though. 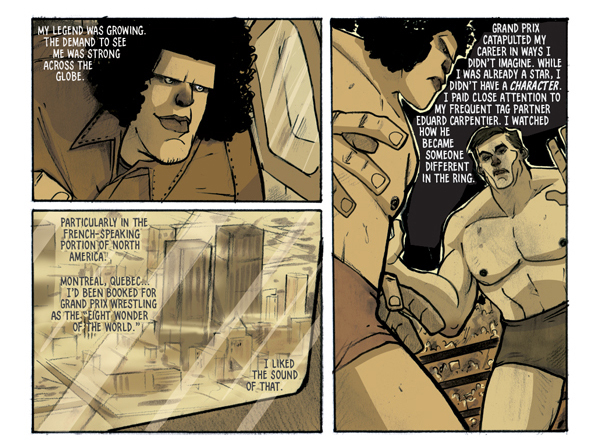 If you recall from my wrap up of this year's San Diego Comic Con, I sat in on the panel dedicated to an upcoming graphic novel based on the life of Andre the Giant. 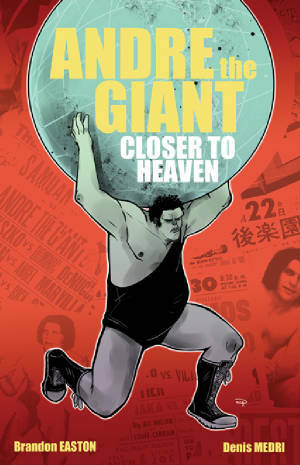 Now, in late November, Lion Forge Comics, in cooperation with his estate, are releasing the authorized graphic novel biography Andre the Giant: Closer to Heaven. Written by Brandon Easton and illustrated by Denis Medri, the book is told in a refreshing first person point of view detailing the highs and lows of Andre the Giant's life. Starting from humble beginnings, Andre Roussimoff was born and raised on farm in France. An athletic boy who stood at six feet by the time he was twelve, he was forced to quit school at an early age to help work the family farm. Seeking his own path in the world, he found himself in the world of wrestling. He used his size to his advantage and rapidly gained favor with the fans. The first big change in his burgeoning career would come with his introduction to his promoter Frank Valois. Frank taught Andre how to build up his persona which gained an even larger following. As the two started to branch out to other wrestling opportunities around the globe, Andre would also encounter what would become a vice for him: alcohol. With continued success also brought the diagnosis of acromegaly, or gigantism. Told that he most likely won't live to see 40, Andre continued to do what he loved most which was wrestling. With Frank's continued guidance, Andre fell under the tutelage of Vince McMahon. From this moment forward, Andre's career launched into the stratosphere. He would soon become a name wrestler in the United States. It was Vince who first billed him as “Andre the Giant”. Soon after, Hollywood came calling which led to Andre being cast as Bigfoot on The Six Million Dollar Man TV series. Andre's continued success did take its toll on him from time to time. He continued to abuse alcohol and would occasionally succumb to fits of rage. He also fathered a daughter, Robin Christensen who became integral to the creation of this book. There's a touching moment in the book where Andre reads a letter from the daughter he hardly knows. It's a bittersweet scene and I can only imagine the heartbreak on both sides. Soon after, Vince McMahon Jr and Hulk Hogan entered Andre's life. After filming his memorable role in the now classic The Princess Bride, Andre returned to the ring where the final seeds of his legacy were being planted. This all lead up to the epic showdown of the inaugural Wrestlemania. The book is thoroughly enjoyable from start to finish. Closer to Heaven will appeal to any fan of Andre the Giant. I liked the first person narrative as it made it easier to get into the story. Telling a biography can be tricky in comic book form but Easton tells it with ease. The style that Medri chose is that of a softer palate and it enhances the words by not presenting overly jarring imagery. If you know a wrestling fan (especially of the 80's era) or just an Andre the Giant fan, then I would definitely recommend picking this up as a gift.